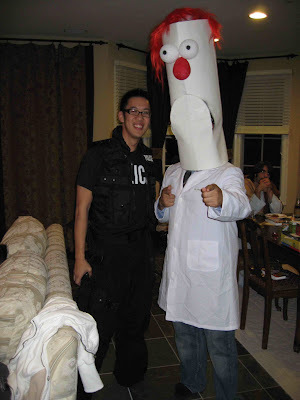 Big Al made it out to 2 Halloween parties over the weekend: Q's Happy Halloween and VJ's Party on the Hill. I'm proud to announce that Big Al took home 2nd place at Q's party and 1st place at VJ's party. Not a bad weekend eh? 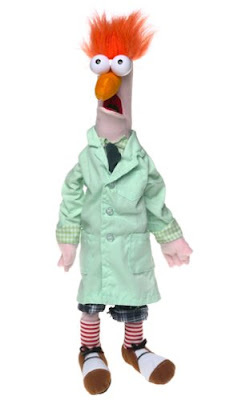 Big Al's 2007 costume was Beaker from the Muppets. It had a few people scratching their heads. Some people called me Elmo. Some people thought I was Dilbert. Some people thought I was just a doctor (especially when I wasn't wearing the head). Others were just baffled - mostly those that were Fresh off the Boat. Big Al's Halloween schedule isn't quite complete. There's Halloween night which looks like an open date, and then there's Lina's Post Halloween bash next Saturday. I'm tempted to opt out of that one just because I've already claimed my title. It would be foolish to go to a party and then put your title back on the line. It's like the World Series Champions taking their title to Japan to play the Japanese champs or the winners of the NCAA Football Coach's poll playing the winners of the AP poll. Foolish!